The funeral will be small and private but a public memorial event will take place later this year. While the date and venue of the memorial has yet to be announced, the launch of Liz Fekete’s new book, Europe’s Fault Lines on 7 February at the Ahmed Iqbal Ullah Race Relations Resource Centre in Manchester will now take place in memory of A. Sivanandan. 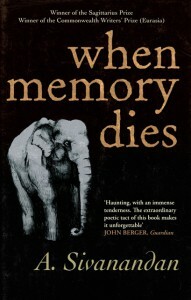 News of the death of Sivanandan, known to his friends as Siva, passed quickly though the anti-racist community in UK as well as throughout India and Sri Lanka where he is an iconic figure, especially amongst Tamils, because of his epic novel on Sri Lanka When Memory Dies (which won a Commonwealth Writers First Book Prize) and his seminal writings on the history, ethnic conflict and class formation of that country. The Twitter hashtag #Sivanandan was set up within hours of his death, with extracts of some of his best-known writings posted online. A day later, the IRR created its own tribute page. Personal messages were also sent to Siva’s wife Jenny Bourne, the family and IRR staff by those who preferred to share their appreciation privately. 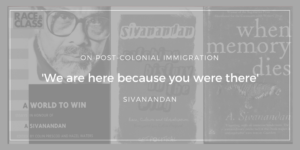 As many contributors pointed to the incisive nature of Siva’s many aphorisms, IRR staff tweeted 21 of his best-known sayings (including ‘We are here, because you were there). The IRR hopes that all those who have been influenced by Siva’s work will continue to add their comments. What is so noticeable about the tributes posted so far is how vital Siva and the Institute he created, have been in encouraging and sustaining the organisational infrastructure of anti-racism in the UK. Wayne Farah, chair of the Migrant Rights Network recalled Sivanandan’s encouragement in MRN’s early days, blogging that ‘The Migrants’ Rights Network is a small part of Sivanandan’s enormous legacy’. Veterans of the anti-fascist movement, the Asian defence campaigns of the 1970s, activists from the Asian women’s movement, from Operation Black Vote, Voice 4 Change, Runnymede Trust, Just Yorkshire, from left organisations and magazines like Red Pepper and from the police and racial harassment monitoring groups that continue to be vital in the defence of BAME communities were also amongst those who commented. 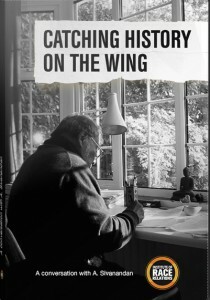 Many others, like Professor Gus John, who like the late John Le Rose and the Reverend Wilfred Wood were on the IRR Council of Management in 1972, recalled the heady days of the IRR’s transformation, when after a battle with management, the staff and members took over its running, taking it away from advising government and towards servicing community organisations. The seminal role played by the internationally-respected journal Race & Class which Sivanandan founded and contributed to for over forty years was noted by many, with his searing critiques against identity politics particularly quoted. In the US, Race & Class editorial members showed their appreciation, with the current affairs radio programme KCSB (co-hosted by Avery Gordon and Elizabeth Robinson) hosting a special tribute. In India, Sri Lanka, Australia and Canada obituaries have appeared in leading media outlets. British journalists David Rose, Gary Younge and Aditya Chakrabortty also showed their appreciation. In his last days, Siva was deeply concerned that a younger British generation, perhaps looking to the US for inspiration, did not know enough about the history of anti-racist and anti-imperialist struggle in the UK. He would have been amazed that so many of the younger generation turned to social media to express sadness and note his unique voice – with organisations like Docs Not Cops, the Anti-Raids Network, Young Muslim Voices amongst those circulating key texts and urging supporters to inform themselves of his legacy. 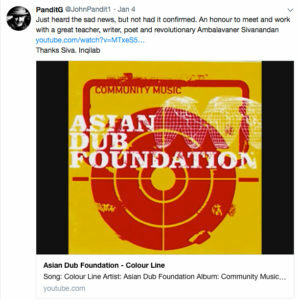 Others recalled how they first got to know of Siva’s work through the Asian Dub Foundation track Colour Line, which provided one of his treatises as lyrics, with Siva even providing some of his singing.